Everyone wants to have the show pool that everyone drools over, but not everyone can afford the WOW factor. A simple way to increase the WoW factor of your pool is to put in some custom pool steps. Vinyl liner steps are the simplest way create something that will really turn heads. The only think that will limit what you do for your pool is simply your imagination. Any pool step or bench can be made to be vinyl liner covered step. You can get a step with a bench added, a sun ledge, or whatever you want. Your pool contractor should be able to take a napkin drawing and then turn it into your vinyl liner steps. If you don't have dogs that will be swimming in your pool, then there is no reason to get fiberglass steps. 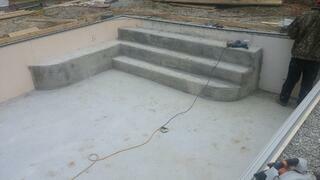 You can have your custom pool steps with one liner so the entire pool matches. One clean look throughout the pool makes your pool stand out and it doesn't cost a fortune. On average, you can get a vinyl liner covered step for as little as $899. If you get extravagant and really start to add benches, bar stools, or sun ledges; the vinyl liner steps can get up to $4,000 - $5,000. Fiberglass steps although some try to match the liner, never look perfect. They will eventually fade, discolor, and then need to be refinished. The biggest issue that we see is from poor installation from the pool builder. If they leave a hollow spot in the step when the backfill, you can actually have them crack 10 - 20 years later. A vinyl liner covered step can be built out of steel, polymer or concrete. If you have read our other blog postings, you will know that we are a big fan of concrete. Why you ask? Concrete is strong, doesn't settle, and will not be affect by time. Steel rusts regardless of where it is in the ground. Polymer steps are rather expensive compared to building a stronger more secure step out of concrete. 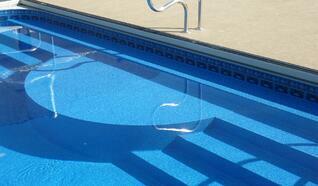 Vinyl liner steps are a great and simple way to increase the look of your pool without breaking the bank. Remember, if you have to ask your builder about custom pool steps, there is a good chance that they shouldn't be your builder.